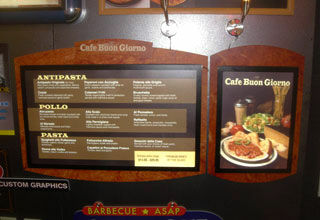 Create a lasting impression with Dollar Signs high quality menu signs! Dollar Signs and Graphics we have been building and installing all kinds of signs for many years. Our graphics designers will work with you to add images and texts to make a mouthwatering menu sign. Our menu signs give customers a well-organized product list that makes choosing a easy, keeping lines short and people happy. We can also install the signs for you.